Eye and Eye slings can be used in choker, vertical and basket hitches. Slings with Half Twist (Type 4) eyes are furnished unless Flat (Type 3) eyes are specified. Sling eyes will be wrapped at the bearing point unless otherwise specified. 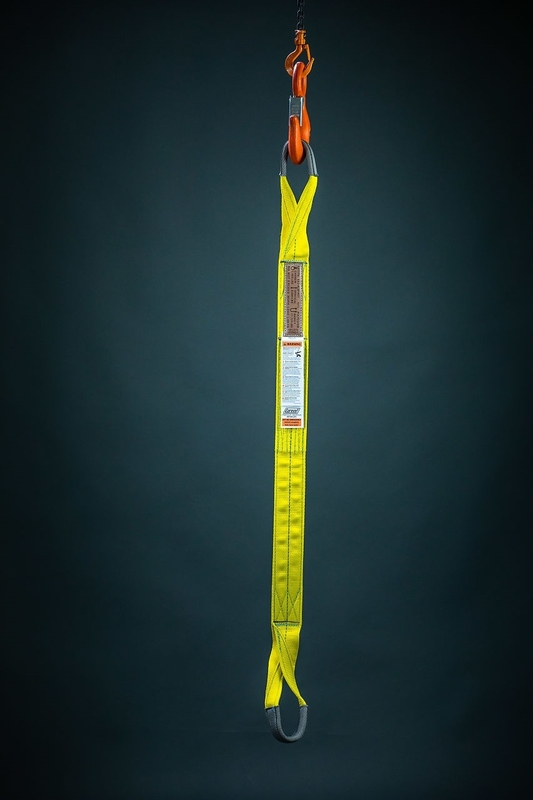 Tapered eyes are automatically furnished on slings over 2 inches wide to provide for a proper relationship between the sling and the lifting hardware. Eyes with no taper are available. The bearing points of Half Twist (Type 4) eyes are oriented 90° to the sling body. The perpendicular relationship between the eye and body in Half Twist, Type 4 eyes results in a comparatively advantageous choke hitch, when compared to Flat (Type 3) eyes. Half Twist eyes perform equally well in vertical or basket hitches. For Half Twist Eyes with Taper, specify "HTT" (EE1-902 HTT) Eye Width-1"
For Half Twist Eyes with no taper, specify "HT" (EE1-902 HT) Eye Width-2"
For Flat Eyes with Taper, specify "FT" (EE1-902 FT) Eye Width-1"
For Flat Eyes with no taper, specify "FE" (EE1-902 FE) Eye Width-2"
Eyes depicted feature standard eye protection, Order Code "J" and does not need to be added to sling stock number. Other eye treatments are available. Available in either nylon or polyester webbing. Polyester webbing is available in (9) heavy web class only. Consider using Twin-Path® Extra Slings in applications requiring 4 ply thick slings, wider than 6 inches. One of the most versatile nylon web slings available, Endless slings can be rotated to provide an infinite number of contact points for the ends of the endless lifting strap and where the endless sling lift strap contacts the load. Endless hoisting slings and straps are for use in choker, vertical and basket hitches. Endless sling strap ends can be tapered and reinforced on request. Endless polyester and nylon sling straps are also referred to as continuous loop slings, type 5 slings and/or grommet slings. Lift-It® Endless slings are available in either nylon or polyester webbing. The length of an endless web sling is measured pull to pull or bearing to bearing on the ends of the endless nylon lift strap, not circumferentially. Polyester web and Nylon web endless slings are formed by overlapping the ends of the heavy duty webbing to form a load carrying splice. 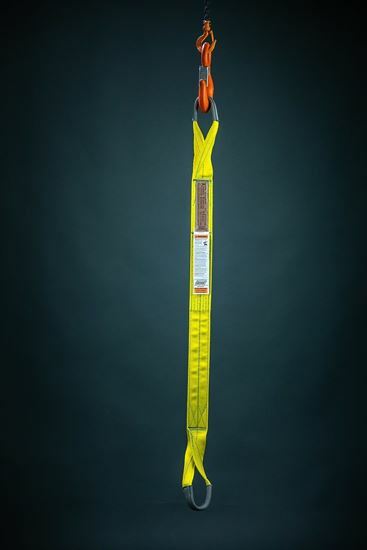 It is recommended when using endless sling straps that the load carrying splice NOT be placed into the load or lift connection points. Likewise, when Endless slings are used in a choker hitch it is recommended that the load carrying splice be placed above the choker point and below the lifting fixture. If an endless sling configuration is desired that does not feature a load carrying splice, we’d recommend the use of a polyester roundsling. Polyester round slings are also sometimes referred to as spansets. If a 200% load test is required on your slings please contact our sales team prior to ordering, 909-469-2251.